The Reality of Alpaca Ownership, 16 yrs and counting. 16 years and counting, do I still look at alpaca ownership in the same way? In a word, no. The reality is, my perspective on alpacas has grown tremendously along with the personal growth I've gone through in the process. The alpacas are still the incredibly cute and enchanting creatures that I fell in love with so many years ago, that much has not changed. Originally the alpacas afforded us a way to make a lifestyle change, a move from the suburbs to small acreage in a rural area. We enjoyed the pace of farm life and the sound of frogs at night while looking up at a sky full of stars. We were living a dream! As our adventure began, it was all about raising alpacas as breeding stock. 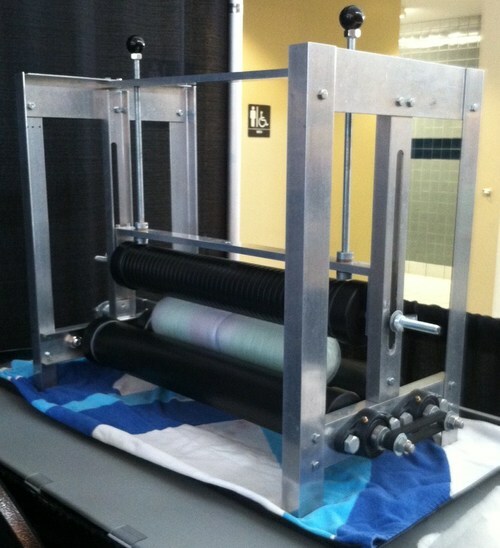 We attended conferences, shows, and live auctions with sales records in the millions. 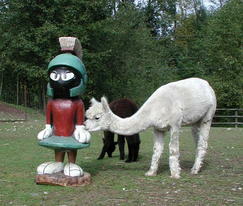 We cared for our alpacas and agisted alpacas for city dwellers that wanted a part of alpaca mania. We sold all the breeding stock that we wanted to, and provided breeding services for other owners. 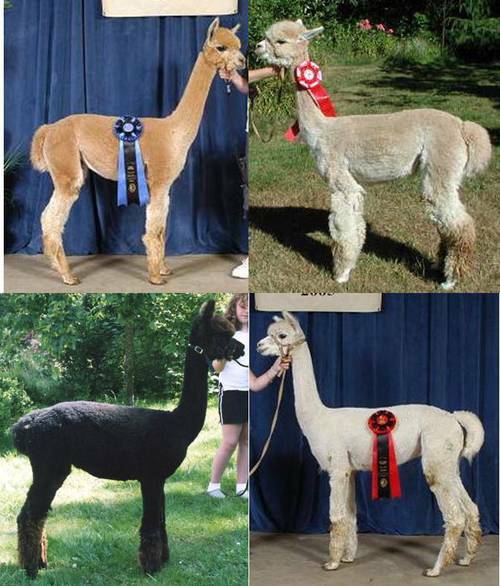 Our alpacas were taking ribbons at big, competitive shows. The fleece was considered a bi-product and there was little to be done with it commercially. Then came the economic crash of 2008 and reality came crashing down. In order for us to continue raising these incredible creatures, we needed a new plan. I had always loved the feel of alpaca fleece but I had only dabbled in the fiber arts. Early on our kids were involved in 4H as we blazed a trail for an alpaca project in our county. I had tried my hand at spinning, felting, and weaving during the 4H phase, but everything was put on the back-burner as life with kids happened. We had joined a couple of fiber cooperatives but there was little available in the way of US made product. I sold alpaca products made in South America to supplement farm income, again, an additional plan was needed because we still had the fleece from our own herd sitting virtually untouched in our barn. 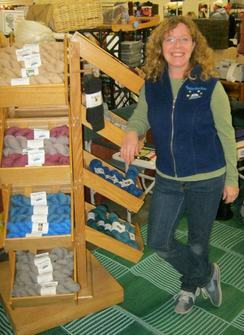 We started shipping our fleece off to mini-mills to offer our own yarn for sale. I was still purchasing some colored alpaca yarn produced in Peru to sell along side of our own natural yarns until the light bulb finally turned on and I started hand dyeing our yarn! That would be the beginning of product creation here on MaRS! 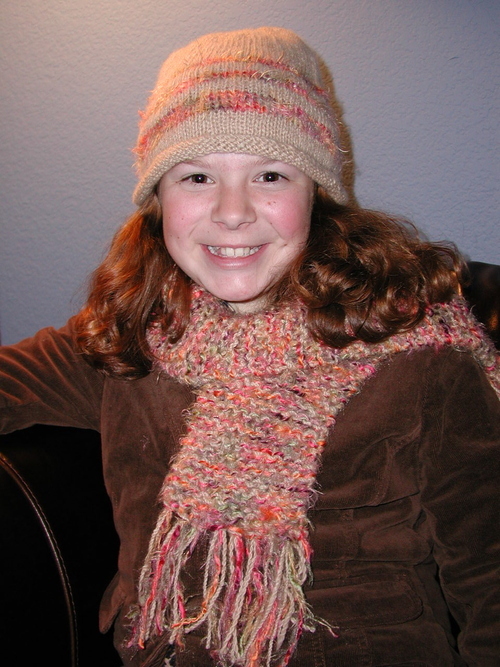 I took a dive back into my memory bank to build on the knitting skills that my Grandmother had shared with me, and I started producing hats and scarfs for sale. The spinning wheel came out again, and I was like a sponge soaking up spinning techniques and hand processing our fleece. My love of color took me from knitting to wet felting where I could literally let the color fly and embrace the outcome. I was no longer afraid to let creativity happen, a true escape from the usual control I held over the rest of my life. The added bonus was that people liked and purchased what I made! I'm also happy to report that there has been growth in the commercial market for alpaca fleece in the US. We are making progress. Then came the farm visits with tour groups, scouts, school groups, and birthday parties complete with hands on craft projects. Up next will be a growing schedule for how to clinics, maybe even a few ladies nights with felting and wine. The sky is the limit! I also work part time at a fleece processing mill and volunteer as an alpaca program leader in a local 4H club. And the alpacas? I've adopted a full livestock model which means there is a beginning, middle, and end plan for all our herd members. We continue to carefully breed for improved stock with bright, fine, beautiful fleece. I never thought I would be open to a terminal market for alpacas, but the alternative with alpacas ending up in rescue situations has changed my mind. 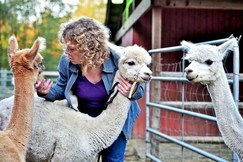 Our alpacas all live a good life and are well cared for, and that's a good thing. Knowing where our food comes from has become more important to us, as it has for many, with all the unknowns of commercial food production. And you know what? 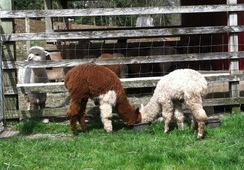 Alpaca tastes wonderful and is an incredibly healthy alternative for smart eating. Samples and recipes are available! What's next? I can't wait to find out! Our 14th Anniversary as Alpacas from MaRS! 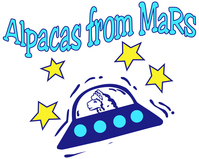 We're celebrating our 14th anniversary as Alpacas from MaRS! 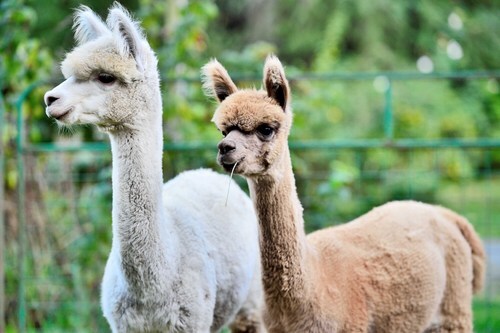 Our first alpacas arrived at the farm in the fall of 1999, but we quickly decided we loved these enchanting creatures and we purchased our first bred female in February of 2000. From day one our goal has always been to produce the finest, most consistent fleeces that we can. 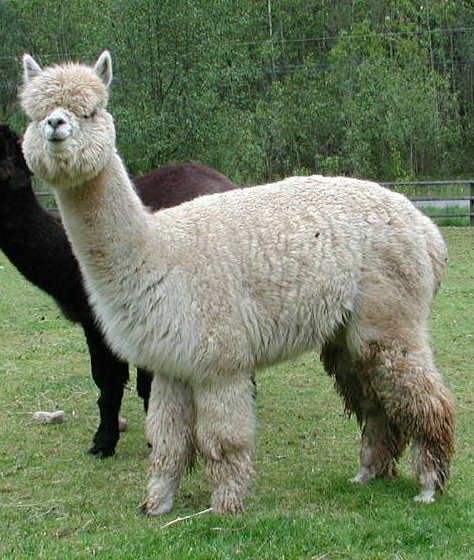 Our breeding program has been focused on heathly alpacas with fine fleece that keeps it's fineness as the alpaca ages. We took our time growing our herd, our first year we purchased a bred female, Heras, that produced a beautiful fawn female, Cassini. We purchased one additional weanling female, La Primavera, and a young male, David Shines, in our first year. Heras was bred to Silas of Bolivia shortly after Cassini's birth, that breeding would result in our only cria born in 2001, Phobos. The foundation of our herd was set. In 2003 we decided it was time to expand our herd and we went about researching and purchasing additional breeding stock. We added brown, black, and gray to the mix, giving us a a fine fleeced herd in a full spectrum of alpaca colors, purchasing from some of the best breeders in the area. Did you know there are 22 natural shades of alpaca? 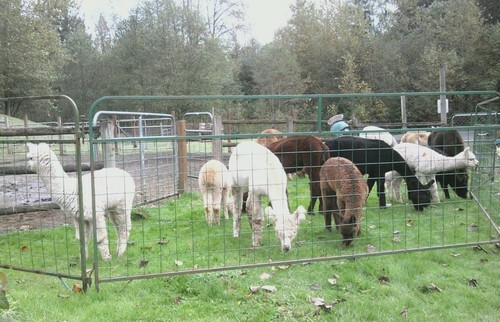 We were involved in the local alpaca affiliates. Rebecca was superintendent for Alpacapalooza for two years in a row, and Mark was the halter show super for the following year. 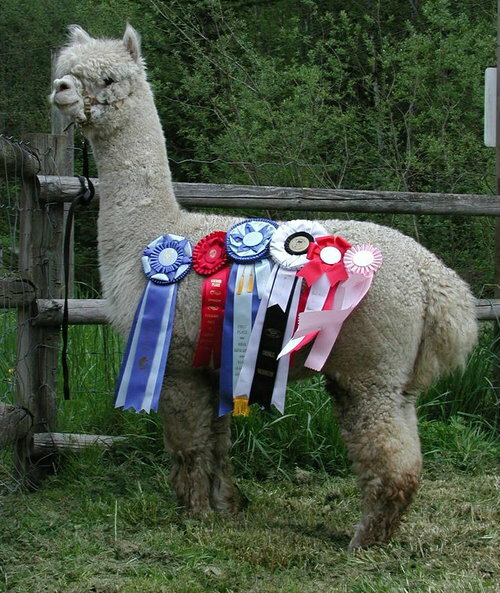 We have enjoyed showing our alpacas and we've even won our share of ribbons too :) We were also founding sponsors for Fiber Fusion NW, a fiber show that brings together all kinds of wonderful fiber! 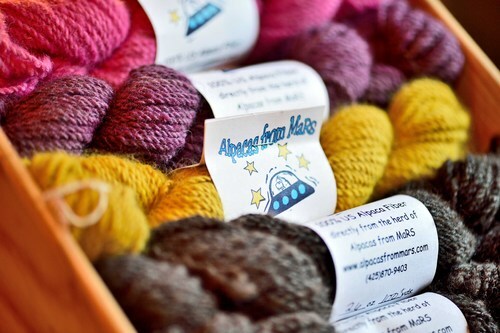 You can find Alpacas from MaRS alpacas in several US states! We have continued our focus on fine fleece and support a couple of the US run fiber cooperatives. We've been members of AFCNA, the Alpaca Fiber Cooperative of North America, not quite from the beginning, but close! We are also members of the Alpaca Blanket Project and we are an active collection site. 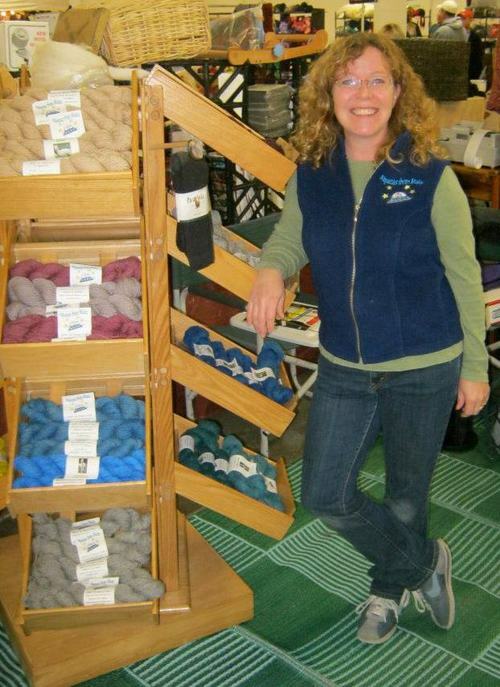 It's so exciting to be a part of the commercial market for alpaca fleece! Rebecca creates one of a kind pieces using the alpaca fleece from our own herd. You can check out those items in our online store. Farm visits are still one of our favorite things about alpaca ownership, we love to share our passion! We were very lucky to have wonderful mentors over the years and we will always our clients with the same. As an owner of livestock, I like to think that I go the extra steps to raise healthy stock. Several years back we had a couple of females that fell sick due to kidney failure. Our vets were wonderful and they ran every test they could think of, but we didn't get any answers. The next year, we lost Isara, a beautiful fawn female. Once again, it was kidney failure, but this time we had tissue samples to test. Blood draws on other girls in the group revealed that 5 others had signs of kidney issues, including the two from the previous year. It was the same time of year as before, so that raised some red flags. Could the alpacas have gotten into a toxic source? The first time around, we walked our pastures and paddock areas with our vets and found nothing. Testing on Isara's tissue samples showed that we were dealing with toxic weeds so we walked the pastures again, and again found no sign of possible suspects. 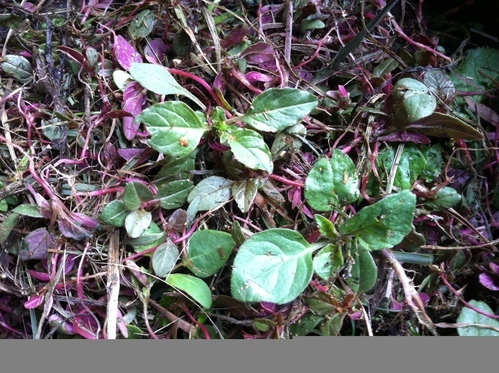 We were looking for two weeds that could cause kidney failure, Dock and Red Root Pigsweed. We closed off the pastures for weeks as I continued to monitor them. On week 4, I finally found the first signs of the pigsweed. The alpacas had eaten them as they came up so that's why we didn't find them on earlier sweeps of the area. They were coming up near the site of an old compost pile. Since the red root pigsweed isn't native to our area, it was making it onto our property via an outside source, our purchased hay! A few months later we lost the original two girls that were sick, Yana and Diana. They just couldn't recover from the damage that was done to their kidneys. Every year since I have made it a priority to walk the pastures on a regular basis and inspect the hay for signs of toxic weeds. The past couple of years have been particularly terrible with large amounts of pigsweed found in the hay. 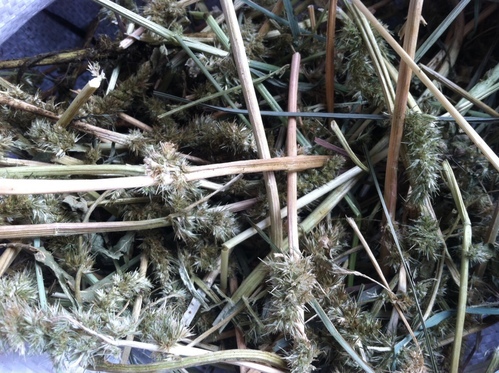 The bad news was that I was finding the weed stocks in the hay, the good news I was finding the weed stocks in the hay and the alpacas weren't eating them. I have had hay replaced, even the hay that was "certified weed free" but the damage is already done. The seeds of the pigsweed are like ground pepper and almost impossible to collect. So even with strict monitoring of the hay, the seeds are planted. The alpacas are eating the seeds and they end up in the poop piles. The best management of a bad situation is to clean up poop piles daily and get them to one compost pile. I then monitor the old poop pile sites, the compost pile, and the areas down hill and around the compost pile. You would be amazed how quickly your eye gets trained to find the seedlings! Please, in honor of Isara, Yana, and Diana, monitor your paddocks and pastures for weeds that don't belong. Once a season or once a month, isn't going to do it. I walk my pastures several times a weeks and I scan the paddocks on a daily basis during the growing season, which is right now! Here is just one link to a toxic plant database. Although it mentions equine, it's a great starting point for all livestock. I guess to some my short weekend trip to attend a local alpaca show would be considered a vacation or an excuse to skip out on farm chores for a couple of days, I would call it an inspiration! Many of us go through our work days in a routine, possibly mundane fashion, and I admit that it's sometimes the case for me when the days are dark and dreary. I look forward to the days of sunshine, warmer weather, new crias in the pastures, and flowers brightening the gardens. And it's also the time for our annual shearing, time to reap the true benefit of raising alpacas, their fleece! What happens to all that alpaca fleece? There are so many options that we are only limited by our imagination. This past weekend I was once again inspired by the creativity of fiber artists. I was inspired to follow through with my plans to create a fiber studio and really get busy with the fleece. I'm not one of those that has a barn or garage full of years worth of fleece since I have participated in the fiber co-operatives like AFCNA and The Alpaca Blanket Project, but that doesn't mean I don't have fleece that I've held in reserve for my own projects. I have sorted fleece that's ready to be sent to the mill for yarn, and I have fleece waiting to be washed and carded for felt. 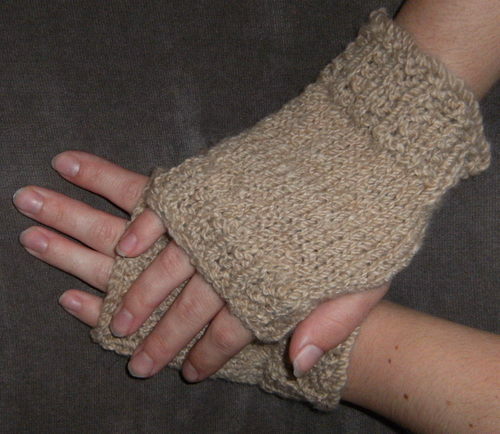 I love to knit with alpaca yarn but the process is slow and end products to sell are limited as a result. I have felting projects in my head but not in production. That's going to change! My studio plans include a small wet felting machine and a rug loom. 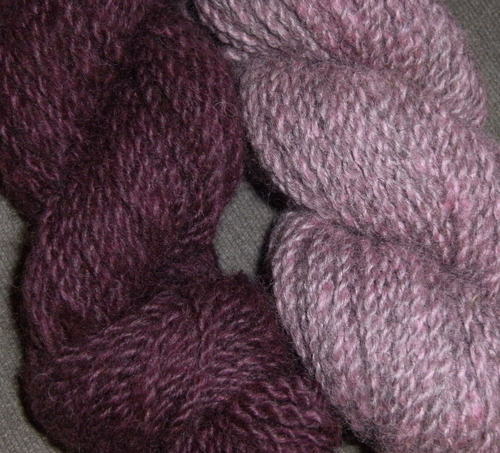 I will have a space designated for dyeing and drying skeins of our own herd yarn. I would love to include space where I can have small creativity workshops for kids and adults. And of course, a farm store is definitely a high priority! Online sales are wonderful but I want a place where farm visitors can really see and feel all that can be done with alpaca. How do I plan to make all of this happen? The first order of business is having my "kids" clean out their things from the garage so I have the space. Mother's day is right around the corner, right? Christmas and my birthday didn't work, but maybe Mother's day. Next would be raising the money to cover the costs of the equipment. Stay tuned for some incredible ideas and deals that will help me reach the end that justifies the means! Inspiration is a wonderful thing! Spring has finally Sprung, or so it seems. even the young ones know their job! It's been a long, dreary winter here in the NW. While much of the nation has reached record highs in early spring, we've had record lows with lots of rain, wind, and even snow. 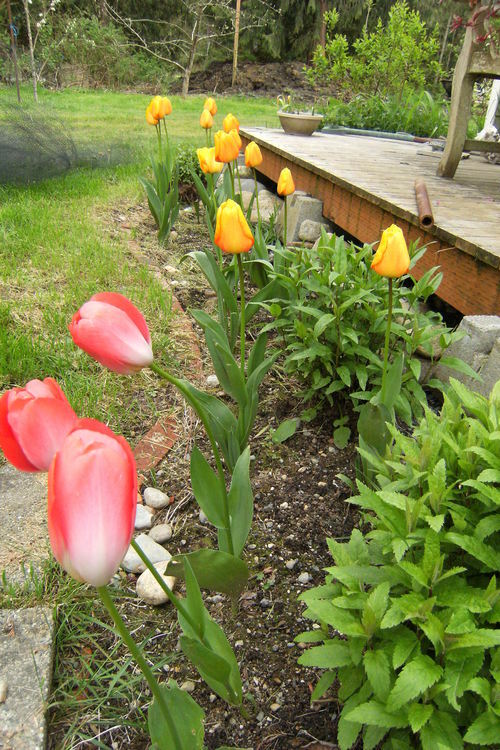 As we reach the end of April the signs of spring are finally popping up literally with smiling daffodils and beautiful tulips. The grass is growing and the alpacas can't wait to be let out to pasture, but for the meantime they help with yard maintenance! Each year we seem to have trouble getting the gas powered mowers in working order, coincidence? Maybe not! Seems alpaca power has it's advantages, no need to worry about them tearing up the yard with their soft padded feet or over-grazing and pulling up the roots. Nope, alpacas are serious about their grass cutting job and they are happy to do it. 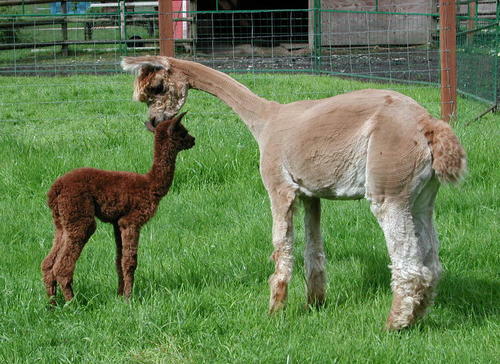 Next month brings our annual shearing, then cria births and breeding decisions fall close behind. The chill is in the air and it's time to wear alpaca! Am I sorry that summer has come to an end on MaRS? Not really. The excitement of new crias running in the pastures, and farm visits are the highlights of the year, but summer is also the time to work on fence lines and tackle the farm to-do list. I think fall is probably my favorite season of the year. It's the time of year to enjoy all that you've worked hard to accomplish before the cold of mid-winter sets in. It's the time of year I find to be the most creative. The evening hours are occupied with new projects and getting creative with alpaca. So far I've tried my hand at dying some of our natural alpaca yarns, and started knitting inventory for gift giving and the winter months. 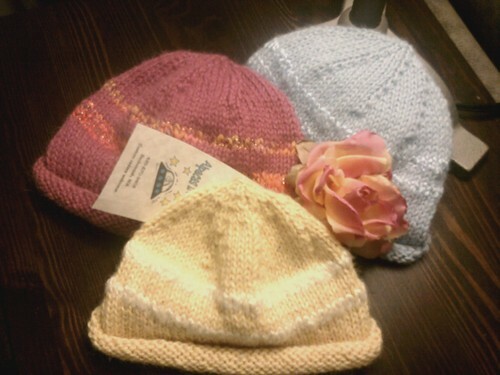 Baby beanies, adult hats, scarves, and now hand-warmers are all finding their place on my needles. Also new are the Paca Pillows I've sewn up for the pampered pet. I've created pet beds that have a removable, washable cover with an inner pillow filled with alpaca fiber. They are sized to fit most standard crates.